Peter Kweku Anowie is the co-founder and manager for Kolics Ventures where he is responsible for the company’s resources to ensure efficiency, cost control and growth. He is armed with a Bachelor of Science degree from Catholic University College of Ghana-Fiapre where he majored in Banking & Finance. Aside from this, he has industry experience in sales, marketing and banking. Kolics Ventures is a social enterprise based in Takoradi, Ghana and owns the Koliko Wear brand aimed at providing customers with quality and affordable ladies and gents wear. 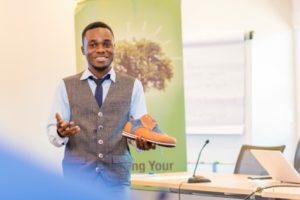 Aside from using recycled and upcycled materials in the production of shoes, Kolics Ventures trains both skilled and unskilled young guys in the community in innovative approaches of starting a business.